The bigger screen smartphones are trending in the market these days. Even at the launch of iPhone 4S there were smartphones in the market which some say are competitors to iPhone, already had the large screen size as compared to iPhone 4S. But as always, Apple try to keep things simple, straight and classy. The iPhone competitor smartphones have up to 4.6inches of screen which makes a phone go very big. We have reviewed number of other Android handsets and almost every other smartphone is trying to give a bigger screen. Apple keep things on the other track and rather putting up huge brick size phones in the users hand, Apple try to keep it small and keep a phone as a phone and a tablet as a tablet. If you want a bigger screen, Apple already has the new iPad which will serve your business. I too agree on this, that the screen size of iPhone 4S and the overall size of the handset is perfect and is very handy to use. 9to5Mac released some of the pictures last month of Apple iPhone 5 housing which showed the body build. 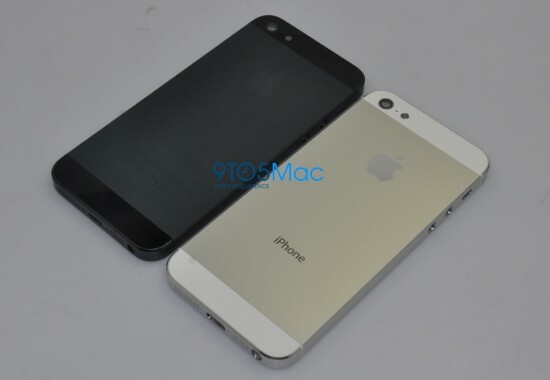 It was seen in those pictures that Apple is releasing a new connector for the iPhone 5 which is smaller in size. It’s size is something similar to the mircoUSB slot. May be, Apple is going to give out the same microUSB which is becoming a standard for every other handset these days. May be the new iPhone 5 data cable is going to change. I am also hearing rumors that Apple will release an adapter/converter type of thing so that people with their old data cable connectors can use them by putting an extension adapter to it, which will give the output as a smaller newly designed structure for iPhone 5.
iPhone 5 leaked pictures show that the shape of iPhone remains the same as iPhone 4 and iPhone 4S but the size is increased. iPhone 5 screen size is 4.08 inches and looks quite good and will still make it look quite handy to use. 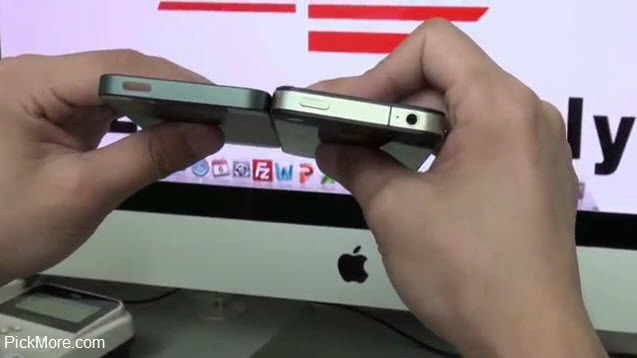 The width of iPhone 5 is kept the same same as iPhone 4S but the height is increased to adjust the new bigger screen. May be the screen is going to be edge-to-edge from the sides to give a more wider space and look. But if we look at the resolution which is expected to be on iPhone 5 is still 640 in width, which means the screen width may remain the same, but the height will increase. 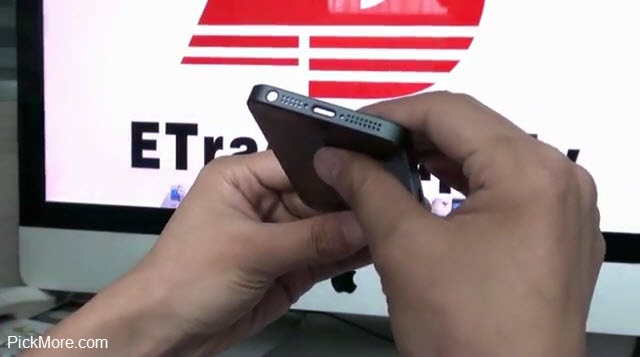 Today eTradeSupply also released a video of the same body build of iPhone 5 and made it more surprising for the users that the iPhone 5 leaked pictures were real. The video shows a comparison of both iPhone 5 and iPhone 4S side by side. The audio jack port of iPhone 4S has been removed from the top in iPhone 5 and brought at the bottom. The new iPhone 5 will have a new smaller size data connection port dock. And most importantly, the new iPhone 5 is thinner than iPhone 4S. Another big change is the SIM card slot. iPhone 5 SIM card tray is much smaller than iPhone 4S. So may be, iPhone 5 wants to bring out a totally new SIM card for their iPhone 5 which is going to be even smaller than the currently used micro SIM in iPhone 4S. If this is the case, it means Apple is seriously trying to kill the gray channel export of iPhone to the countries and mobile operators which will not be affiliated with Apple. Currently in most of the countries where iPhone is not sold directly by Apple, the customers use the SIM cutter to make their SIM card as micro SIM for iPhone 4S. So if iPhone 5 is bringing out a new size exclusively, it means Apple is going to restrict their customers to only limited number of mobile operators and countries. iPhone 5 has unibody built which means that the back and the center piece are now a single built unlike iPhone 4S. The iPhone 4S has the screen size of 3.5 inches and in new iPhone 5 leaked pictures and video it shows that the screen size is increased in the height and it will be 4.08 inches. 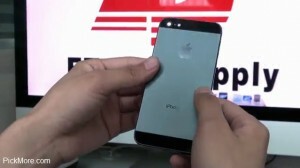 iPhone 5 resolution will be 1136×640 (320PPI). Yes! still not an HD 720p screen. This is quite confusing for me that the competitors of iPhone are already giving out 720p HD screen so why would Apple want to lag behind. The iPhone 5 body housing looks slimmer as compared to the iPhone 4S and may be iPhone 5 will be lighter in weight as compared to iPhone 4S. But in the video, the LCD / screen was not shown attached to the housing. May be just like the iPhone 4S the screen will pop out of the center aluminum body of iPhone 5 so will only make very minor change in the thickness of iPhone 5. Data cable connector port size reduced. A new data cable will be there for the new iPhone 5. New SIM card tray, even smaller than the current iPhone 4S micro SIM card. Loudspeaker and Microphone space at the bottom has bigger holes. Height of the handset increased to accommodate 4 inches screen. The back side of the phone is a metal aluminum plate. Previous Previous post: Nokia 110 and Nokia 112. Are They Low-End Smartphones?